This is a sponsored post. I am an ambassador for Publix Savannah Women’s Half Marathon & 5K. Due to that relationship, I receive a complimentary race registration, as well as other sponsor amenities in exchange for my honest review. All opinions are my own. 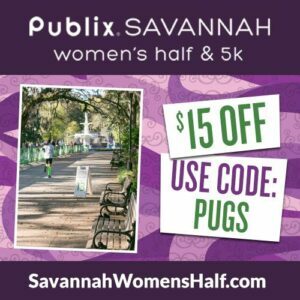 The last Friday of the month is a free day, so I thought I would share some reasons to add Publix Savannah Women’s Half Marathon & 5K to your spring race calendar. I am so looking forward to April 8 and the third annual Publix Savannah Women’s Half Marathon & 5K. 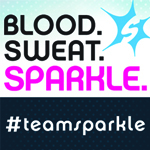 It’s a beautifully done event, comprising an entire weekend of running, shopping, friendship and fitness. Spend the weekend in one of the East Coast’s most beautiful cities. Savannah is such a beautiful city – it has a little bit of everything. I can easily spend entire days just walking the squares, soaking in the history and architecture, shopping in the local stores, and sampling the delicious cuisine. Getting to run 13.1 miles through these streets is a wonderful way to see Savannah, and having so many sights to see helps the miles pass quickly. Receive a really unique participant gift. 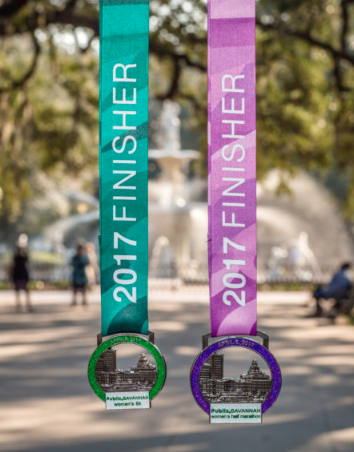 The Publix Women’s Savannah Half Marathon & 5K offers a little something different than the standard race shirt to its participants. I do love the idea of race shirts, but the truth is they don’t always fit properly and I very rarely run in t-shirts. 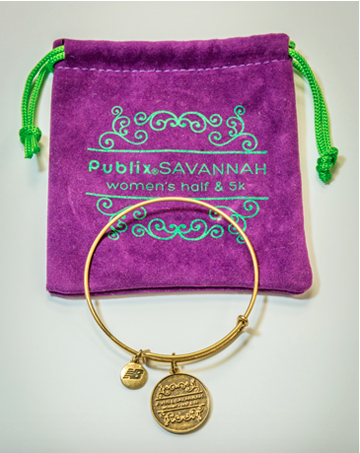 At the Publix Women’s Savannah Half, registrants will receive this New Balance gift: a stunning expandable bangle. I can’t wait to show mine off after the race! But the bling doesn’t stop with a bracelet! This year’s finisher’s medals are even more beautiful than last year’s! The Savannah skyline stands out in relief against a sparkly round frame. I love the cut out details and the thick custom ribbons. Finishers of both distances will receive one of these beauties! 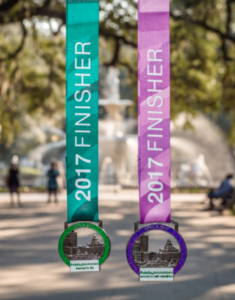 The Publix Savannah Women’s Half prides itself on its unique ending. The finish line is just past the iconic fountain in Forsyth Park, which lends itself to some absolutely amazing end-of-race photos. The countdown is on! Just 42 days until one of my favorite girls’ running weekends! 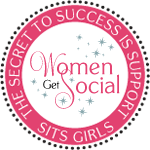 Will you be joining us? 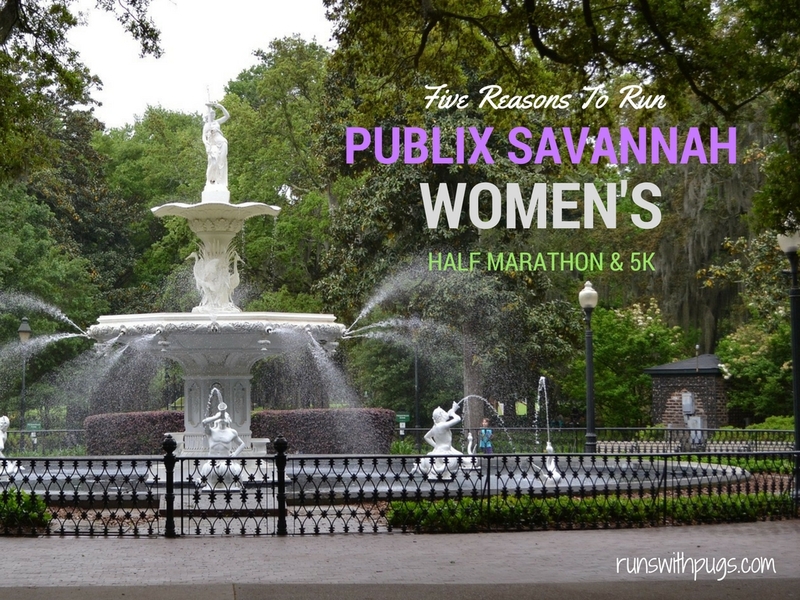 What would you most look forward to in at the Publix Savannah Women’s Half? What makes a racecation great for you? Wow, that all does look great! I love the finish! I’ll have to keep it in mind for next year. I really want to run a race in Georgia, but I can’t decide between Atlanta or Savannah because I know both cities have great races! Do both! I think there is a huge difference between the terrain/feel of both cities, so … why not experience both of them? Ha! I am obviously no help whatsoever. You don’t to persuade me. I’ve already wanted to visit Savannah.. But I live so far away and I don’t know anyone who lives there so I tend to stick to Florida race-cations. 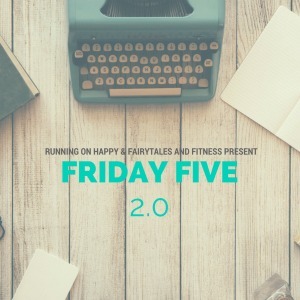 Darlene recently posted…Friday Five 2.0: Sick During Your Training? North Florida is practically South Georgia 🙂 I get it. The country is so big and there are so many fabulous events. It’s hard to get to them all. Well, I would have to say I think I need to be Savannah on my list of racecations! It looks fabulous and I love shopping so…. best of both worlds right?? Gina recently posted…It’s Runfession Time! You will NOT be sorry. On its own, Savannah is amazing. Add in a race weekend? It’s winning all over the place. you have done a lot of fun races lately! I am all about fun races this year! Enjoying what I’m doing is the key to it all! It is definitely one to put on the list! You had me at Publix, you had me at Savannah. OH how I wish! This makes me miss home so much! 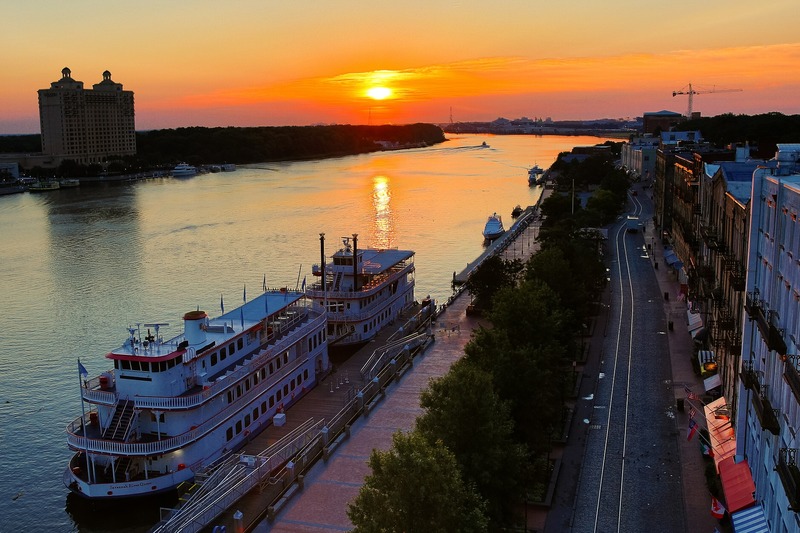 Savannah is a beautiful city for a race-cation, it is on my bucket list for sure! Mary Beth Jackson recently posted…February in Florida- what to runfess? 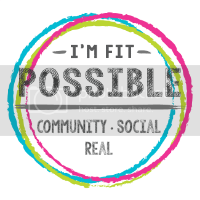 Kimberly Hatting recently posted…Warm Weather…So, what’s there to Runfess? I wish I could do this one with you! Savannah is on my must-visit list! I’ve never been to Savannah but would love to visit! I love the bangle and medal! This definitely looks like an amazing half marathon! Loops like a beautiful place to run. I haven’t don’t any big racecations but have a few I’d love to do someday! Aww you are making me wasn’t to run this race! A bracelet AND a medal, and a scenic finish??? Too bad there are so many great races in April. Maybe one year i’ll make it there. Right? I mean that is bling on top of bling! How can you go wrong? March and April are so busy with races. I feel like I have or could have one every weekend. I’ve been to Savannah once and would love to get back someday. I’ll have to keep this race in mind for future years. It’s definitely one to consider! You would love it! That sounds like a great race! I have not been to Savannah, but it looks gorgeous there!! Savannah is such a beautiful city. One of these years, this race is going on my list! Looks like a great race, I hope to do it soon. Toni recently posted…Cheaters Never Win and Winners Never Cheat….Right?